Andrews Newsstand: Go fishing or Read About It. Go fishing or Read About It. Wading through the weeds, blazing a trail to the place no-one else knows, rolling my canoe behind me on its home made cart to a quiet launch area for a little drift fishing. Carrying three rods rigged three different ways to discover which flavor they're biting today, ready to swap-out rigs in a heartbeat. I've got my favorite lures in my tackle-bag, live worms as a guaranty for pan fish and corn-pops as my catfish caller. It's going to be a beautiful day according to the weather-man. High around eighty later in the day, but right now it's about 65 at daybreak. My canoe cuts through a shallow fog as I ease it into the water while trying not to make a sound. Then as I slide the handles of my rods into the tubes I've mounted to the thwart, I hear a splash not too far from me. I raise my head to pinpoint where the sound came from, and there it is. A swirl in the still morning fog. It looks small from here but since it's on the other side of the pond, it must have been a pretty good size. I like to stretch a little before I sit down, because once I'm in the canoe I won't be standing again for another few hours. A long deep breath as I drink in the cool morning air. What's that? I smell watermelon, there must be Crappie nearby. This is going to be the best day of my life. I CAN FEEL IT!. I push off the canoe and step inside. Everything I need for the day is in the canoe with me, or even a week if I chose to stay that long. My paddle creates tiny whirlpools in the water as it pushes the canoe forward. 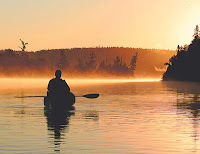 And as I close my eyes to focus on sound of the water passing under the canoe, I can hear birds singing in the morning sun. I must be in Heav ""DING"". Someone walked in the store and woke me from my daydream.